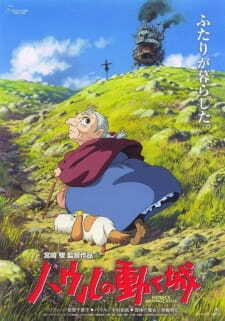 Howl No Ugoku Shiro premiered at the Venice Film Festival in 2004 and was later released to Japanese theaters in November, making it one of only three Studio Ghibli films not to be released in July. In 2004 the film won the Osella Awards for Technical Achievement in the 61st Venice Film Festival, the Best Japanese Movie Overall in the Mainichi Film Awards and an Excellence Prize, Animation in the Japan Media Arts Festival. In 2005 the film won the Animation of the Year in the Tokyo International Anime Fair and the Audience Award in the Maui Film Festival. In 2006 it was nominated for the Best Animated Feature in the 78th Academy Award, but lost to the movie Wallace and Gromit: The Curse of the Were-Rabbit. I have watched this movie many many times since it is one of my favorite Miyazaki films, so why not write a review? I have also read the book, which takes a much different direction than the film does. And yes, it may seem like I rate highly but for some i was between 9 or 10, and I have explained things that I disliked that may not reflect in my number ratings. Story: the story is about a girl named Sophie who gets turned into an old woman and ends up living with a wizard named Howl in his moving castle. The story is the only part I felt was lacking in this movie. Though I have to admit I see more flaws with the story after reading the book (even though I find the movie much better). Overall, I felt many of the war scenes were overdramatized and left a lot of questions. There were also a lot of small things throughout that they could have done a better job at explaining. Even after watching the movie so many times I cannot fully explain some scenes and still have questions about the movie. Animation: The animation is absolutely stunning and many of the backgrounds look realistic. I also have to say that I am impressed with how Sophie is animated, and how it is so easy to tell when she is aging/regressing just simply by looking at the animation (her voice also helps). Overall this is the most impressive Miyazaki art I've seen and I really haven't seen much that can top it. Sound: I'll just start off by saying the music in this movie is so beautiful. I love every single background music in this movie, and the only song I don't like so much is the theme with the words that plays at the end. Aside from the beautiful soundtrack, the sounds in the movie are so dead on. Hearing Sophie's bones crack as an old woman is really painful, and as much as I don't like Sophie's voice, her seiyuu does a great job at portraying the character and how she fluctuates between young and old so frequently throughout the movie. I think all the seiyuu in the movie were good as well. Character: The characters in this movie make up for all the lack of closure in the plot. Each character has their good points, even the Witch of the Waste. I personally adore almost all the characters, though I actually like Sophie the least of all. Calcifer, Heen, and Turnip head are such adorable and fun characters to watch (and Heen and Turnip have pretty much no lines in the whole movie). Howl is also another loveable character as well. The characters have such different personalities that you will probably like at least one character or more. Enjoyment: Obviously I enjoy this film a lot. I've watched it so many times! Each time I sit there in awe of the animation and empathize with the characters. It's one of those movies that I love to watch and I have not gotten bored of it yet. I do have to say that towards the end I get slightly bored with the stressed focus on the war, but that only lasts at most 15 minutes. This movie is defenitely worth watching, and even if you watched it and didn't like it, you only spent two hours watching it since it's a movie. I think it's defenitely one of Miyazaki's better works. If you have time or interest, I think it's worth checking out the book, since it's a completely different take on the story. It's got a lot less romance between Sophie and Howl in it, but it brings a lot more character development to Markl and Sophie's sisters (she has more than one in the novel). But if not, just watch the movie!! I'd figured that waiting so long to see this made me a bad Miyazaki fan, but after seeing it, I wasn't much bothered by my long delay anymore. STORY - This movie was apparently based off a book, but as I haven't read the book, I'm judging this movie as a work all on its own, for better or worse. So I suppose this was, in a way, a story about courage and facing one's fears, but it was approached in such a roundabout way that I'm really not sure, even now. The premise of the movie -- Sophie getting bewitched into an old woman -- seemed almost completely random, and I was left wondering why? and what was the point of that? Those questions were, for me, repeated a ridiculous number of times throughout the course of the movie. Indeed, most of the scenes seemed haphazardly spliced together with little rhyme or reason connecting them. Eventually, the focus of the movie fell onto Howl and his troubles, which was fine, except that we seemed to forget entirely about Sophie's initial dilemma because of it. In some ways, Howl's reminded me of Spirited Away, what with its eclectic assemblage of characters, all with their own problems and goals. But while Spirited Away maintained and remembered its initial story and theme, Howl's Moving Castle was seriously all over the place. The further we progressed into the movie, the more it seemed like Sophie's problems were taking a backseat to Howl's, and even her position as a member of his castle and one of his helpers didn't seem very important. One of the things that annoyed me the most was also the fact that the spell placed on Sophie was never explained the depth -- all you knew was that she couldn't tell anyone about it (which was pretty useless since most characters seemed to be able to tell anyway). Nothing was explained as the spell seemed to gradually fade; when Sophie randomly appeared to be her old self, you were never sure whether it was for real or a dream. Eventually, you sort of accepted that she was slowly regaining her old self, but even then, you weren't sure why. CHARACTER - I wasn't really all that impressed by any of the characters in this movie. Most of them seemed to be typical of Miyazaki both in personality and goals and were consequently predictable. Sophie is an all around &quot;good&quot; character who only wants the best for her family and friends. Howl is the mysterious one with great power and internal insecurities. Calcifer is the sharp-tongued, sarcastic one who just wants to be free, despite a seemingly good relationship with his master. And Markl is just a good kid, more or less in the same vein as Sophie except younger, and the Scarecrow was a similar personality as well. The Witch of the Waste is a completely stereotypical semi-villain, as is Suliman. Though there are certainly attempts at expanding on some of the characters' very flat personalities, I don't really feel as if any of them are successful. Sophie's fascination and eventual love for Howl was a little interesting, but the feelings could be attributed very easily to the typical goodness of her personality, and it didn't seem like Howl was very special to have her affections. Similarly, Howl's feelings for Sophie seemed generic, or perhaps he (and all the other characters) could not help but be attracted to her goodness, as there didn't seem to be very many flaws in that purity at all. ARTSTYLE &amp; ANIMATION - This is easily what contributes the most to the entire movie. As we have come to expect from Studio Ghibli, Howl's Moving Castle was an exceptionally beautiful film. The highly detailed background renders were superb and featured all sorts of fantastical elements, giving the environment a wonderful personality. The streets and storefronts were inviting and cheerful, and the darker alleyways held a mystery of their own. The characters were all wonderfully animated, especially Howl, who transformed slickly between his human and harpy-like form. MUSIC - I don't remember anything especially extraordinary, but I think it's safe enough to say that most of the music was satisfying and fitting for their scenes. VOICE ACTING - I've only seen the movie subbed. The voices were about average, but I would say that's more because of the characters' flatness more than lack of talent on the part of the actors. Calcifer is the only one that had a particularly memorable voice -- it was a little whiny and a little scratchy: absolutely perfect for his grumbling character. OVERALL - Howl's Moving Castle was a very fun movie to look at. The visuals were gorgeous and everything smoothly animated. Unfortunately, the story and characters definitely left a lot to be desired; there was so little substance that I might have gotten about the same impression if I'd seen the whole thing on mute (or without subtitles). I've been told that the original novel is better, and I wonder if Miyazaki's downfall is only in that he was trying to adapt someone else's work, because certainly I know the man's capable of telling a story better than this. NOVEL, ANIME: Howl's Moving Castle was originally a young-adult fantasy novel written by Diana Wynne Jones in 1986. It won a Boston Globe-Horn Book Award in 1987, and was also was designated an ALA Notable Book for children and young adults. Howl's Moving Castle was produced by Studio Ghibli (Ponyo on the Cliff, Spirited Away), and directed by Hayao Miyazaki (Spirited Away, Nausicaa of the Valley of the Wind). Howl was released in theatres in Japan on November 20th, 2004, and showed dubbed in theatres Stateside starting on June 10th, 2005, courtesy of Disney, and is available both subbed and dubbed on DVD. STORY: Sophie Hatter is a young, self-conscious young woman who, after a chance encounter with the wizard Howl, is cursed with the body of a ninety-year-old by the spiteful Witch of the Waste, and is unable to tell anyone about the curse. She ends up going into the Waste, and, with the help of an animated turnip-headed scarecrow that she helps, ends up finding Howl's home; a legged, walking, amalgamation of a castle. In order to break her spell, she makes a deal with the fire demon who powers the castle, Calcifer; if she can break the spell on him and Howl - which he also can't tell anyone about - he will break hers. Howl's Moving Castle isn't necessarily one of Ghibli's strongest movies, story-telling wise. There are a lot of disparate plot elements floating about, with not a lot of explanation given, or even development, for that matter; the movie kind of just drifts from scene to scene, as if it can't decide what plot element it wants to focus on. Probably the biggest example of this is Sophie's curse. There are times in the movie where she'll appear younger or older; it's hinted that this difference in physical appearance is tied to her self-confidence, but it's never explained, it just happens. The ending is kind of unsatisfying, as everything's quickly wrapped up in a neat package with even little to no explanation of sudden plot elements that end up popping up. The characters themselves are all fairly well fleshed out, though, and are at least intriguing to watch; the moments in this movie that center around the characters alone are where it really shines, such as Sophie going through and cleaning the house, Markl going to market with Sophie, or Calcifer and Howl talking by the fire. Taken in terms of the original novel, Howl is a nice retelling. The basic plot elements from the novel are mostly intact, though a great deal of the actual plot has been changed around. If you don't mind a looser retelling of the novel, then you should be fine with this; however, if you're looking for the novel translated exactly onto the screen, then you may not want to see this. -The castle. I can't say enough about how intricately this was done; just the design itself is amazingly thought out, and the animation of the movement and all the little parts moving and operating on their own and as a part of the larger whole is incredibly steampunk. -Anything to do with magic being used. Incredibly created, especially in how it manifests from character to character, and with beautifully intricate detail. -The war sequences. Incredibly realistic and devastating, though it should be noted that production on this was happening while the Iraq War and the bombings were just beginning. MUSIC: Joe Hisaishi does the composing work on this, as he always does. While his music has most of the normal chords and progressions it normally does, the music here tends to be variations on several instruments of the main theme song, which, while not my favorite ever, is passable. Not the greatest soundtrack he's ever done, but still fairly solid. SEIYUU: The cast for this is fairly new to voice work, but it doesn't show; there are some excellent performances in this, especially the voice actor for Calcifer. I actually like the sub and dub about equally, so I can't state preference here for any one cast. I do like that there is a single seiyuu for Sophie, whether she's young or old, as it just shows you the range of the seiyuu. VOICE ACTORS: The English dub for this has some fairly big names for the performances; Christian Bale does a pretty good job (and even utilizes the Batman!growl) as Howl, Jean Simmons does an amazing job as the older version of Sophie (even though I don't really understand why there needs to be two separate voice actors here), Billie Crystal does a good job of being the comedic relief in Calcifer, Lauren Bacall is an amazing Witch of the Waste, and Crispin Freeman even shows up for a few lines. Overall, a solid performance. DUB: I have absolutely no criticism whatsoever for the dubwork on this. Translations are done accurately, there's no intentional flubbing of the original meaning, and it's fairly well done. LENGTH: The movie does tend to drag at times, especially with how the movie tends to float from scene to scene. The whole thing feels kinda dreamy, though, and you tend to not notice where the time's gone at the end of it. OVERALL: Not Ghibli's best story or score, but still has wonderful characters, amazing animation, and a fairly solid dub, and cast in both languages. A dreamy sort of film, good for a rainy afternoon. Based on the book by Diana Wynne Jones, I approached Howl's Moving Castle after seeing Spirited Away (another Miyazaki film). Watching the opening scene we are introduced to a massive walking metal shack, the "moving castle" of the title. I honestly didn't know what to make of the film initially, but just that scene demonstrated to me the film's animation was going to be as good as, if not better than Spirited Away. We are introduced to a young girl named Sophie Hatter and her town Ingary, where she runs a hat shop. Apparently there is a war going on with a neighboring country, so we get to see spectacularly animated warships of many kinds (including Final Fantasy-esque flying warships). In the middle of all this is a wizard called Howl, who is being pursued by a witch called the "Witch of the Waste". Anyway as many stories go, Sophie lands in a bit of trouble and ends up being saved by Howl - but the mere fact she had some association with Howl seems to upset the Witch of the Waste so she puts a spell on Sophie. This is where the main part of the story kicks off. As expected from a Miyazaki film we are constantly being wowed with lush landscapes and detailed scenery, and in fact a lot of scenes are put there merely for the "isn't that lovely" factor, which at times makes the film move a bit slowly. Being it's 2 hours long though, this does not deprive the film of it's story. This film is full of lively and interesting characters, including little animal sidekicks, talking fires, enchanted scarecrows and shapeshifting wizards. So if you watch this film, you are definitely in for a treat. As a final point, don't make the same mistake as I did and compare this film to Spirited Away. They are nothing alike (for one thing, this film doesn't even take place in Japan). Even though I enjoyed Spirited Away, I like this film just as much, if not more, for different reasons. So did Sophia's Curse break or not in the end?